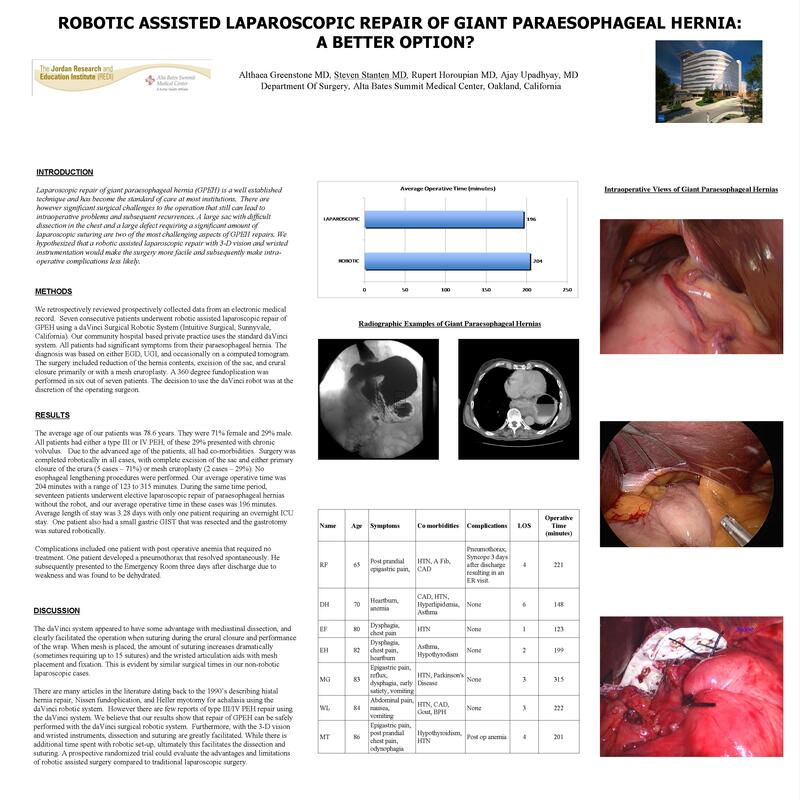 Robotic Assisted Laparoscopic Repair of Giant Paraesophageal Hernia: A Better Option? Althaea Greenstone, MD, Steven Stanten, MD, Rupert Horoupian, MD, Ajay Upadhyay, MD. Department Of Surgery, Alta Bates Summit Medical Center, Oakland, California. INTRODUCTION Laparoscopic repair of a giant para-esophageal hernia is a well established technique. However, a large sac and diaphragmatic repair make the surgery technically challenging. Several reports in the literature on the surgical repair of giant para-esophageal hernia have described incomplete excision of the sac and difficulty with extensive suturing. We hypothesized that the 3D vision and articulating, wristed instrumentation should make the robotic operation easier. METHODS The present study consisted of seven patients who underwent robotic repair of giant para-esophageal hernia using a daVinci (Intuitive Surgical, California) Surgical Robotic system. The surgery included reduction of hernia content, excision of the hernia sac, crural closure either primarily or mesh cruroplasty and a 360 degree fundoplication. RESULTS There were two males and five females. The mean age was 78.5 years (range 65 to 86 years). The robotic repair was successfully completed in all seven patients with complete excision of the hernia sac, crural closure or mesh cruroplasty, and 360 degree fundoplication. The daVinci robotic system appeared to have some advantage over the traditional laparoscopic approach especially during mediastinal dissection, and suturing during cruroplasty and during mesh hiatoplasty. The mean length of stay was 3.28 days (range 1-6 days). Only one patient required a greater than 24 hour ICU stay. The average surgical operative time was 205 minutes (range 123 to 315 minutes). Post operative complications included anemia that did not require blood transfusion in one patient and Pneumothorax with spontaneous resolution in one patient. A single patient presented to the emergency room with syncope 3 days after discharge from the hospital due to dehydration that responded well to intravenous fluid replacement and no additional measures. CONCLUSION Our results show that robotic assisted repair of giant para-esophgeal hernia can be safely performed without serious morbidity. The robotic technique facilitates complete excision of the hernia sac, as well as suturing during cruroplasty.